I made these shorts like a year ago. Or more than that. Or less? When you've lived in a place with barely-seasons, it's hard to remember when anything happened. Either way they've been long overdue for a post. 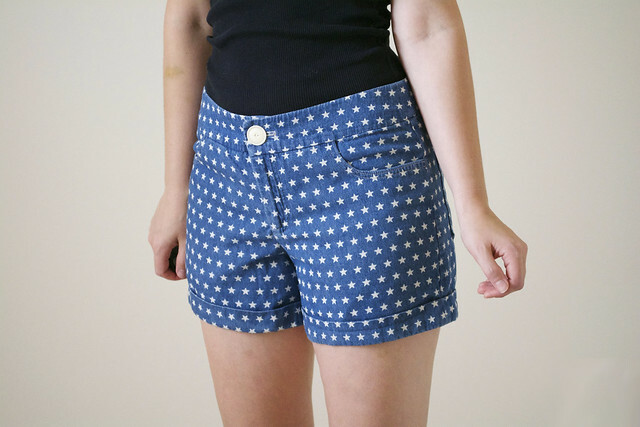 These are the Grainline Studio Maritime Shorts, and oh how I love them! If you're intimidated by making something in the Realm of Pants, I'm here to say, don't be! This pattern was really easy to follow, and Jen has a full photo tutorial posted on her website that is amazing. I definitely referenced it during the fly zipper portion. I scored the star printed denim for free at a fabric swap. Yes, for free! A gift from the sewing gods. Or perhaps the denim shorts gods. Since making these I've made another pair. Spoiler alert: they will probably appear in a future post!